Headache Be Gone Roll-On. Easy blissful relief for headaches, migraines, sinus. Therapeutic-grade, premixed. 100% natural, safe, hassle-free. We are so happy to bring you Headache Be Gone, formulated perfectly to give you natural, easy relief from headaches, migraines and sinus pain and discomfort. We blend three amazing, 100%-pure essential oils: peppermint, which offers cooling stress relief thanks to the menthol and offers natural pain relief and boosted brain power by increasing blood flow; lavender, which calms, relaxes and eases anxiety and tension; and frankincense, an amazing therapeutic oil that also aids in tension relief. Next, we dilute the essential oils with just the right amount of our favorite almond carrier oil. By measuring and mixing ahead of time, we make it easy on you, ensuring the right amount of essential oil to make the blend most effective therapeutically while still remaining safe. This high-quality blend is so wonderful that you can get relief just through topical use only. This is a good thing because it's not for ingestion. Simply apply the essential oil blend on your forehead, temples, neck or other tense area and massage in. Keep Headache Be Gone around the house, office or in your first-aid kit just in case you feel a headache coming on. For external use only. What about sensitive skin?If you'd like to be on the extra-safe side or have extremely sensitive skin, simply roll a bit on your upper arm and wait 24 hours to be sure there's no irritation. ALL-NATURAL, TOP-QUALITY essential oil blend of lavandula angustifolia lavender, mentha arvenisis peppermint, wild-grown boswellia carteri frankincense from fertile-soil Somalian olibanum trees. EASY HEADACHE RELIEF, wonderful therapeutic powers. Enjoy the calming, anxiety-easing effects of lavender; cooling, pain & stress relief of peppermint; tension-relief qualities of frankincense. SO CONVENIENT! All oils premixed & diluted with almond oil so it's safe and hassle-free for you. Simply roll on temples, forehead, back of neck. 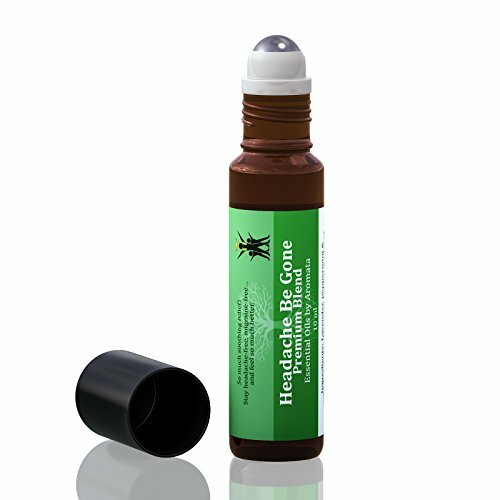 Roll-on bottle is ideal when traveling or on the go. WE HAVE YOU COVERED! Dark bottle protects oils from oxidizing & becoming ineffective. None of our oils contain preservatives, artificial colors or dyes, parabens, synthetics. Not tested on animals. BUY WITH CONFIDENCE thanks to our 100% money-back guarantee and enjoy the high quality of this blend. FREE GIFT BAG with your oil (random color: white, gold or red organza bag). If you have any questions about this product by AROMATA, contact us by completing and submitting the form below. If you are looking for a specif part number, please include it with your message.